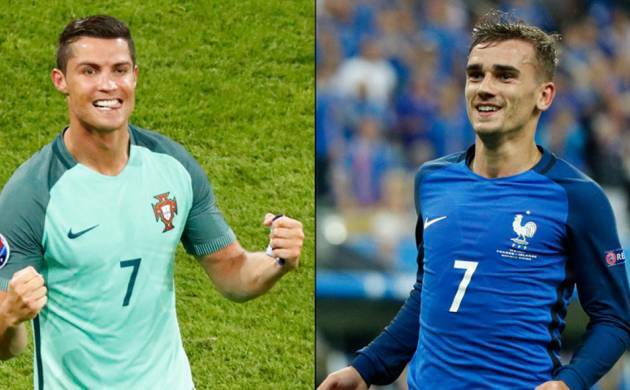 Cristiano Ronaldo’s battle-hardened Portugal stand between hosts France and a cathartic victory in Euro 2016 final at Stade de France. The stadium was targeted by suicide bombers during France’s friendly against Germany last November in attacks across Paris that left 130 people dead. It cast a black shadow over the tournament, but following a joyous semi-final victory over Germany, France aim to prevail in a third major final on home soil after the 1984 European Championship and 1998 World Cup. “There is lots of fervour and lots of joy and happiness in France,” France coach Didier Deschamps said after the 2-0 win over Germany in Marseille. The November attacks, claimed by Islamic State, struck particularly close to France forward Antoine Griezmann. He was on the pitch at Stade de France and his elder sister, Maud, survived the assault on the Bataclan concert hall in central Paris that claimed 89 lives. Griezmann missed a penalty for Atletico Madrid in their Champions League final defeat by Real Madrid in May and made a poor start to the Euro in France’s 2-1 win over Romania. But after coming on to net a 90th-minute opener against Albania, he has emerged as the star of the tournament, scoring in knockout-phase wins over the Republic of Ireland, Iceland and Germany. With six goals—three more than any other player—the 25-year-old is in line for both the Golden Boot and the UEFA player of the tournament prize. Ronaldo, however, served a timely reminder of his ability to decide a game with a brilliant bullet header in Portugal’s 2-0 semi-final win over Wales. Ronaldo has never tasted victory against France, but he is not alone as Portugal have lost the last 10 meetings between the countries, stretching back to 1975. France have twice beaten Portugal en route to Euro success, Michel Platini and Zinedine Zidane netting extra-time winners in the semi-finals of the 1984 and 2000 tournaments. They also overcame them in the semi-finals of the 2006 World Cup, before losing on penalties to Italy in what was their last major tournament final. Portugal were stunned 1-0 by Greece as hosts of Euro 2004 in their only previous major final appearance. Deschamps, 47, captained France to glory at the 1998 World Cup and Euro 2000 and is seeking to add a third major title to his international trophy collection. The former Juventus midfielder has a reputation in France for being lucky and it was enhanced by Thursday’s win over Germany, who dominated the game for long periods. His side will start as favourites, but although Portugal’s win over Wales was their first inside 90 minutes since their arrival in France, they are wily and dangerous. “We believe in ourselves, we have always believed,” said midfielder Joao Mario. “The coach has given us this confidence, this spirit. Portugal coach Fernando Santos is sweating on the fitness of centre-back Pepe, who missed Wednesday’s victory over Wales in Lyon with a thigh muscle problem. Bruno Alves is on standby to deputise again, while defensive midfielder William Carvalho will return from suspension in a match expected to attract a global television audience of 300 million. For France, Deschamps must decide whether to keep faith with a 4-2-3-1 formation, which has allowed Griezmann to flourish, or bring in midfielder N’Golo Kante and revert to a 4-3-3.